An average of nearly 10 attacks a day were carried out on refugees in Germany last year, according to the country’s interior ministry. 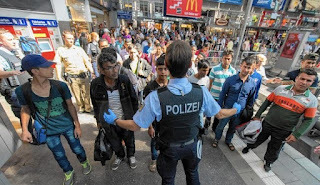 Attacks injured 560 people, including 43 children, and prompted accusations that the country’s hardened stance on the refugee issue was encouraging hate crimes. Three quarters of attacks were against individuals outside buildings housing refugees, with 1,000 attacks on the building themselves. A further 217 refugee organisations and volunteers were targeted, according to the preliminary figures released by the ministry. Germany has been struggling with a backlog of asylum applications although the number of refugees arriving in the country fell to around 280,000 last year, down around 600,000 on the year before, following the closure of the Balkan migration route. The authorities have recently toughened its refugee procedures, bringing in strict benefits rules, speeding up the removal of failed asylum seekers and paying refugees to return voluntarily to their own countries. Chancellor Angela Merkel has faced a backlash for her decision to open the country to people fleeing conflict and persecution, and the issue expected to be central to the federal elections in September. Opinion in Germany is polarised with the government under fire for not taking action against a reported rise in hate crime. A politician for Germany’s left-wing Die Linke party, Ulla Jelpke, blamed the violence on far-right extremists and called for the government to take stronger action. “Do people have to die before the right-wing violence is considered a central domestic security problem and makes it to the top of the national policy agenda?” she told regional news agency Funke Media Group. She called for the government to “stop giving the impression through new tougher asylum laws that refugees are a threat’. A spokesperson for Amnesty International said: “There are structural problems in Germany with how it prevents and deals with hate crimes. “We need to see better risk assessments, more protection at certain locations and prosecutions of these appalling racist crimes.